Century City is a district within the city of Los Angeles, located immediately adjacent to the Beverly Hills. 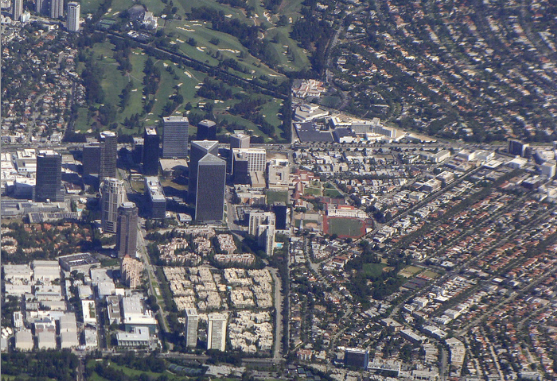 The above aerial photograph shows Century City on the left, Beverly Hills to the right. My wife and I were in Los Angeles earlier last year, and had some time to walk through the areas pictured above. We started at the intersection of Olympic Blvd and Avenue of the Stars. Above is the now completed "The Century" condominium tower. The upper units are going for $5-$6 million dollars. The top unit was recently purchased by Candy Spelling (widow of TV producer Aaron Spelling) for a mind boggling $35 million dollars. 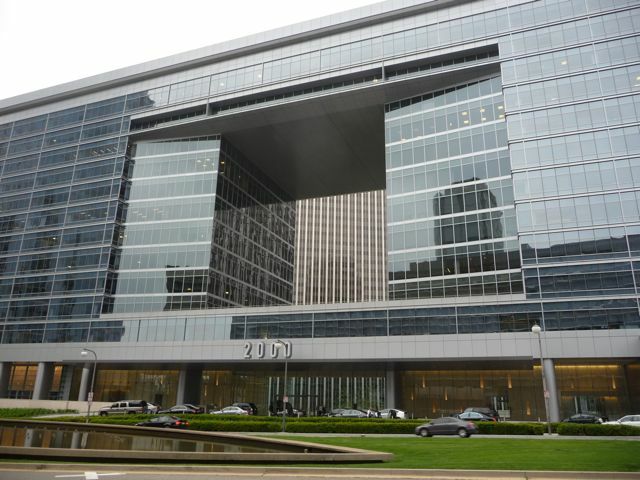 That's not $35 million for the building, that's $35 million for one unit. Walking north, the "2000 Avenue of the Stars" office building - often referred to as the "Death Star". 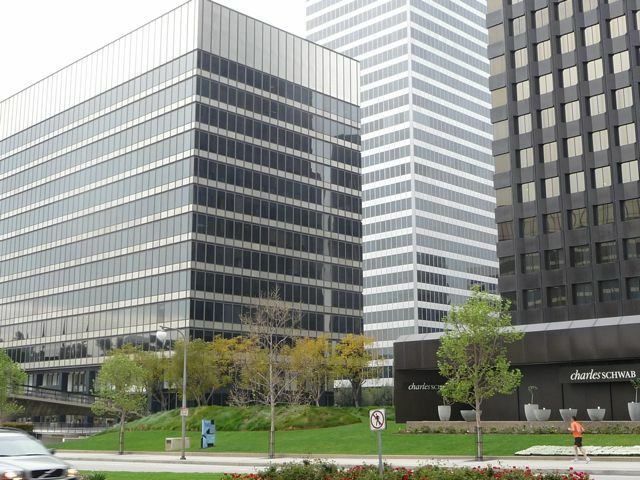 Built on the site of the former ABC Entertainment Center, 2000 Avenue of the Stars, along with the twin triangle Century Plaza Towers," form the "Century Park" development. Sorry, not a fan. Office buildings along the northern edge of Century City. 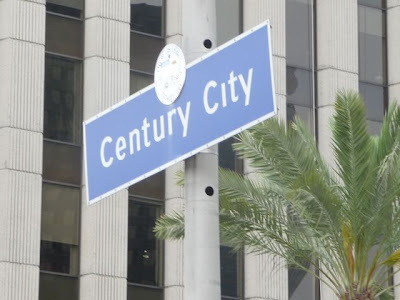 Century City was built on the old 20th Century Fox's back lot, beginning in the early 1960's and was designed to be a "city within a city." Here's a link to a previous post with some more historic background and photos. The building on the left was originally known as Century Park East, located on the corner of Avenue of the Stars and Santa Monica Blvd. My dad worked across the street in the similarly designed Century Park West building, and I spent a couple summers working at his office. 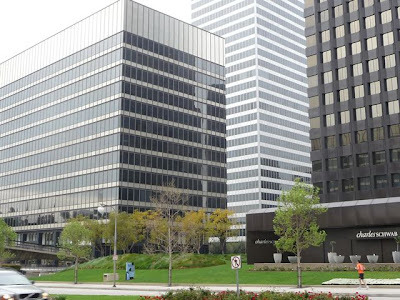 As a teenager in the 1970's I loved the vibe and feel of Century City. At the time, everything still felt so new and modern. 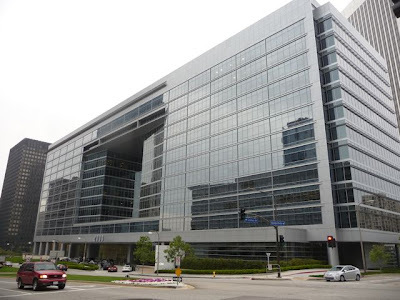 I loved the office towers, the outdoor shopping center, and huge set backs from the street. Guess my perspective has changed as an adult. 35 years later, I see this same layout of Century City as a negative. The large setbacks and lack of any sort of retails or commercial space at ground level removes all pedestrian life from the streets. The result is what can feel like a ghost town, even in the middle of the day. Above, looking up Avenue of the Stars. Granted, no cars on either side of the street at rush hour during a weekday makes this a very unique shot. 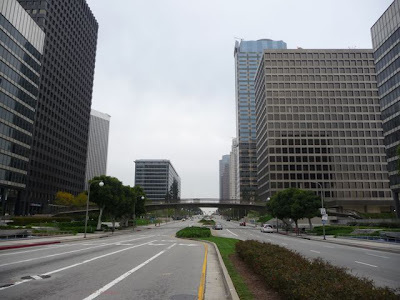 Reminds me of a previous post on Matt Logue's "Empty L.A." project. But even at the busiest times, you'll rarely see people on the sidewalks. Most people drive into Century City, for work - or perhaps shopping at the outdoor mall - then leave. 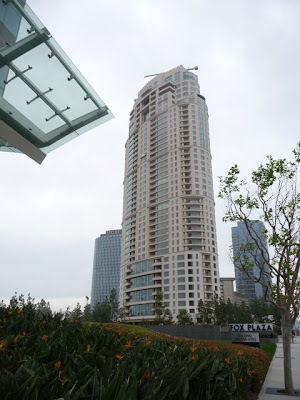 As an aside, f you are looking for a place to park, I would suggest Century City's Westfield Shopping Center, which offers three hours free parking. By way of contrast, I had a lunch appointment in a Century City office tower a few years back. Two hours parking was $32. 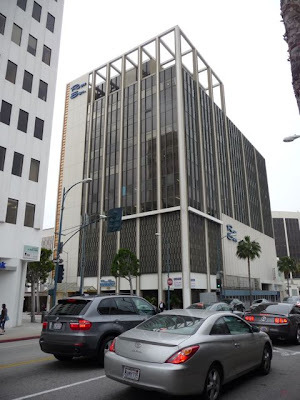 In what can be described as an "experiencing L.A." moment, the cost of parking was more expensive than the cost of our lunch. Fortunately, the guy I was meeting with picked up both lunch AND validated my parking. While Century City is a district within the city of Los Angeles, Beverly Hills is it's own, separate city. Beverly Hills and it's interesting neighbor, the city of West Hollywood, are completely surrounded on four sides by the city Los Angeles. 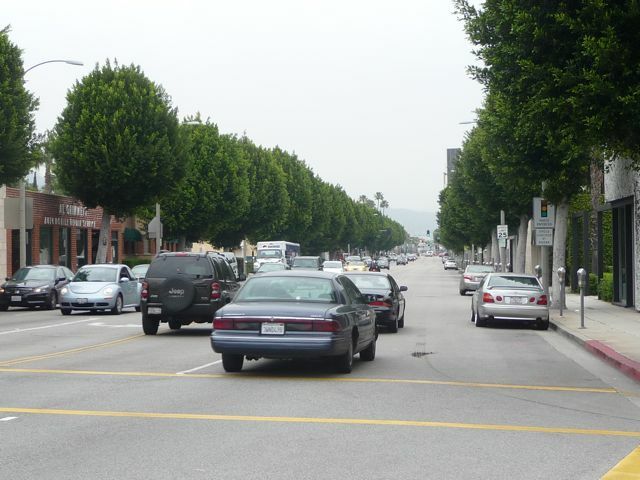 Walking along Santa Monica Blvd, looking northeast towards West Hollywood. 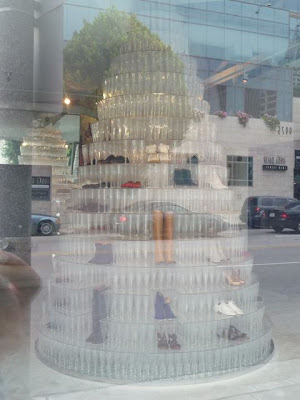 This is what most people think of when they Shoe boutique (translation: high end shoe store). Not our taste, or price. Not everything in Beverly Hills is over the top expensive. Across the street was a pizza delivery shop. 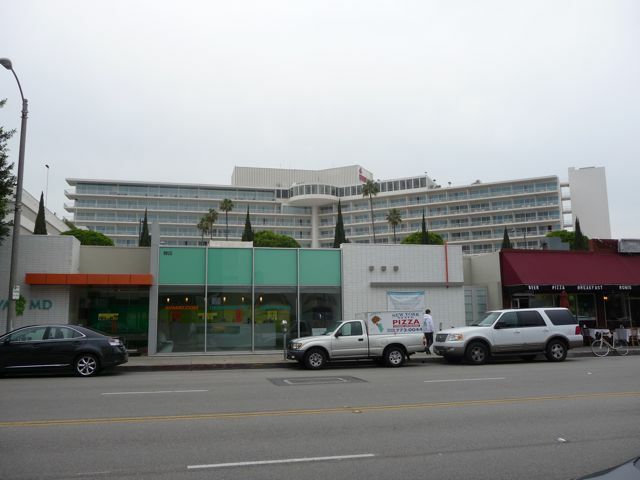 The building in the background is the Beverly Hilton Hotel. My High School Prom was held here back in the day. Long story, but no - I didn't go. 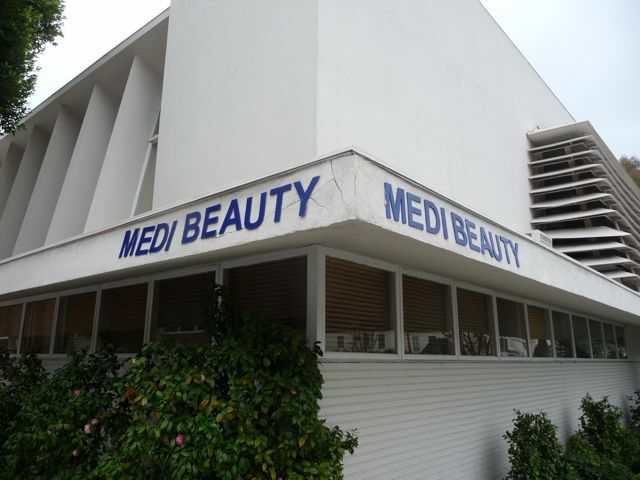 Medi Beauty - a plastic surgeon - located on the corner South Santa Monica and Charleville Blvds. A "google map" search turned up over two hundred plastic surgeons in Beverly Hills. 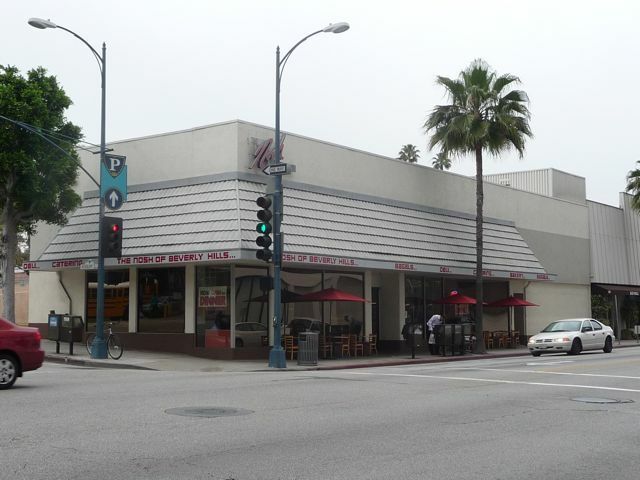 Nosh of Beverly Hills, corner of South Santa Monica and North Roxbury Drive, where my wife and I stopped for breakfast. 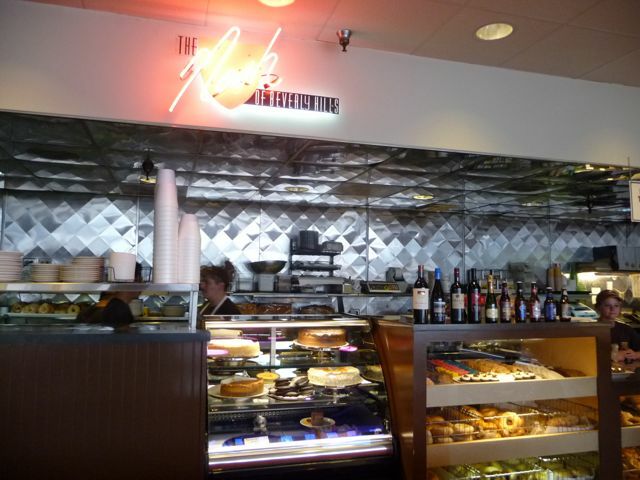 Nosh is a yiddish word meaning snack or little meal. Nice place. 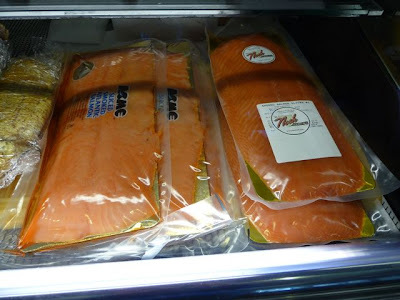 Lox by the pound. Delicious on bagels. I can't imagine buying $35 worth, though. Another "experiencing L.A." moment - Nosh's version of the gift shop at the end of the ride. 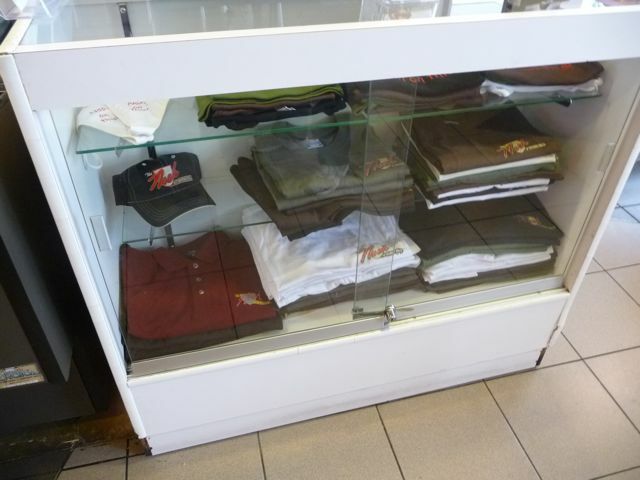 You can buy shirts or hats at the register. 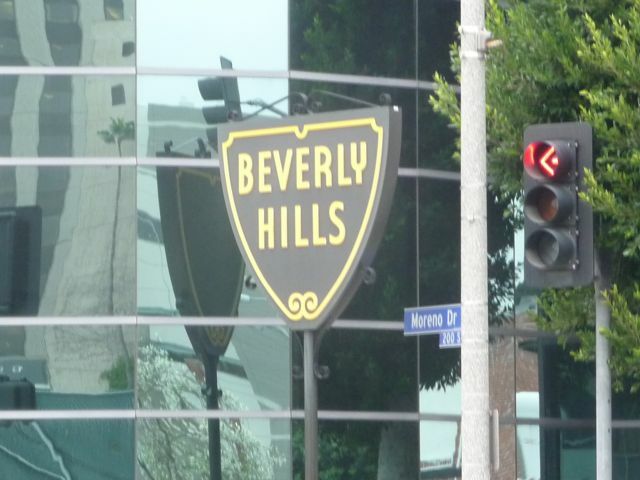 In contrast to Century City, Beverly Hills has a ten story high limit in it's business district. A couple of small tables were set up outside along the street. This was our view while we ate breakfast. 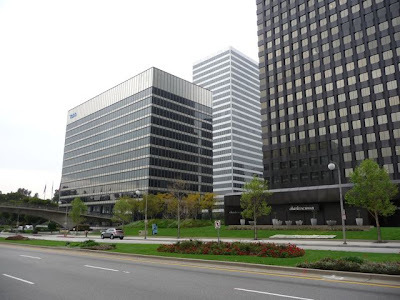 Contrasting the two areas, I definitely prefer the much more traditional urban layout and design of Beverly Hills to the 1960's era design of Century City. More energy on the street, more - well - life.